Mayan Princess Video Slot Guide & Review - Casino Answers! Mayan Princess is a 5-reel, 20-line video slot developed by Microgaming, featuring a wild symbol, multipliers and a free spins feature. You can play the Mayan Princess video slot game at All Jackpots Casino and Nostalgia Casino. Coin sizes on the Mayan Princess slot machine are $0.01, $0.02, $0.05, $0.10 and $20. You can bet 1-10 coins per line and 1-20 lines on every spin you make on the Mayan Princess video slot. You can bet as little as a penny per spin up to the highest total bet of $40. The betting range is excellent, especially for casual players. To play all 10 coins and all 20 paylines, hit the “Bet Max” button. For all other bets on Mayan Princess, hit the “Spin” button. 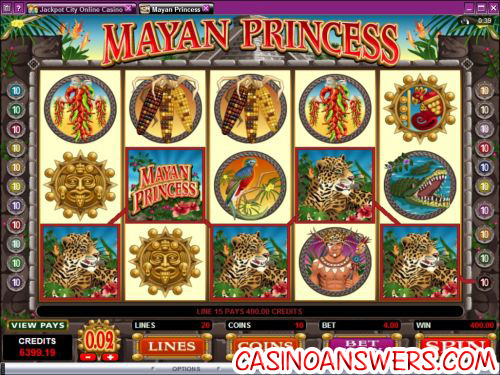 The highest paying symbol on the Mayan Princess slot game is the Mayan Princess logo. 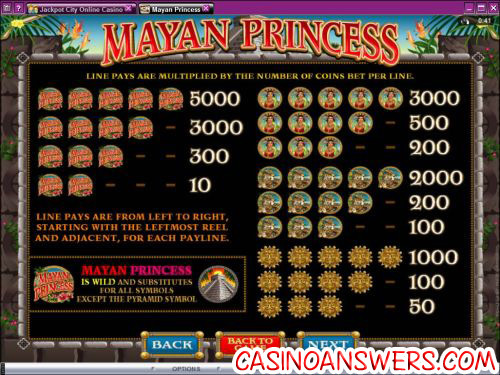 When 5 Mayan Princess logo symbols land on a selected payline, you will can win up to the 5000 coin top jackpot. The Mayan Princess logo is wild and substitutes for all symbols except for the Pyramid symbol. Other high paying symbols on the Mayan Princess video slot are the Princess (3000X), Jaguar (2000X) and Sun symbols (1000X). When the Pyramid symbol lands on both reels 1 and 5 at the same time, you will win from 10 to 20 free spins with a 2X multiplier. The free spins feature can be re-triggered. All bets and lines played are the same as the game that triggered the free spins feature. You can win big by triggering the Mayan Princess free spins feature at All Jackpots Casino! By switching Mayan Princess over to Expert mode, you can play 5 or 10 autoplay spins. You can also click the “Auto Play” button to open up advanced settings. You can play 5, 10, 25, 50, 100, 250 or 500 autoplay spins and set the autoplay mode to stop if a win exceeds or equals $100, $500, $1000, $5000 or $9999. You can stop autoplay mode on Mayan Princess at any time. Mayan Princess delivers presentation-wise, but lacks in special features. Fortunately, this is made up by several very good payouts you can find on the slot. Mayan Princess has four payouts at 1000 coins or more, which is pretty impressive. To play the Mayan Princess video slot, sign up and make a deposit today at All Jackpots Casino! Can players from the United States play Mayan Princess for real money? Players who are based in the United States of America cannot play the Mayan Princess online slot game for real money. However, they can play the Mayan Queen Video Slot Review or play it at the USA-friendly Slots Oasis Casino. For more on Slots Oasis, please read our Slots Oasis Casino Review. Where should I play the Mayan Princess video slot? We recommend that you play the Mayan Princess slot machine at either All Jackpots Casino or Nostalgia Casino. For more on All Jackpots Casino, please read our All Jackpots Casino Review. Where can I play more jaguar slots? If you’re a fan of the jaguar, you can play the Golden Jaguar Video Slot at VIP Casino or if you’re in the United States, you can check out the Aztec’s Treasure Video Slot at Slots Oasis Casino. Where can I play a free Mayan Princess Flash game? While you can’t find a Mayan Princess Flash game at All Jackpots Flash Casino, you can play the similar video slot Aztec’s Treasure Video Slot at Slots Oasis Flash Casino.